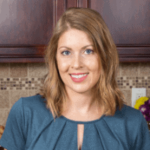 Published: Apr 11, 2019 · Modified: Apr 11, 2019 · By Jen Sobjack · This post may contain affiliate links. 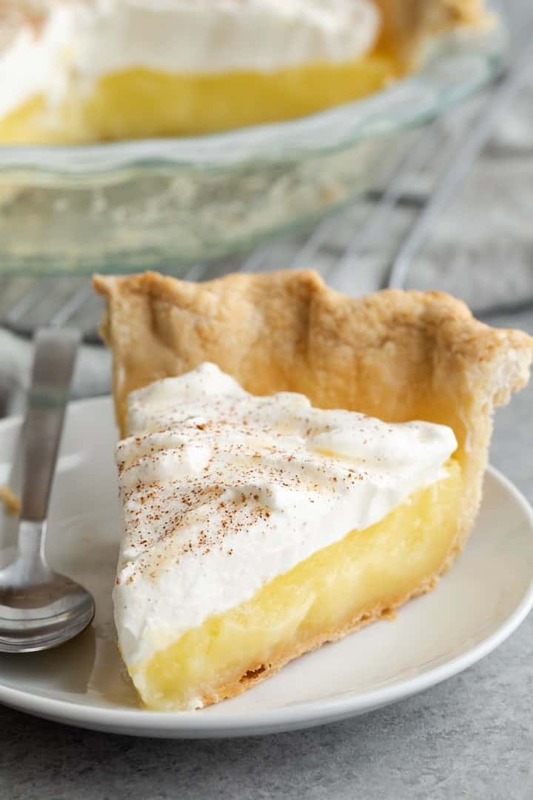 Vinegar pie has a custard-like filling that’s sweet and tangy. 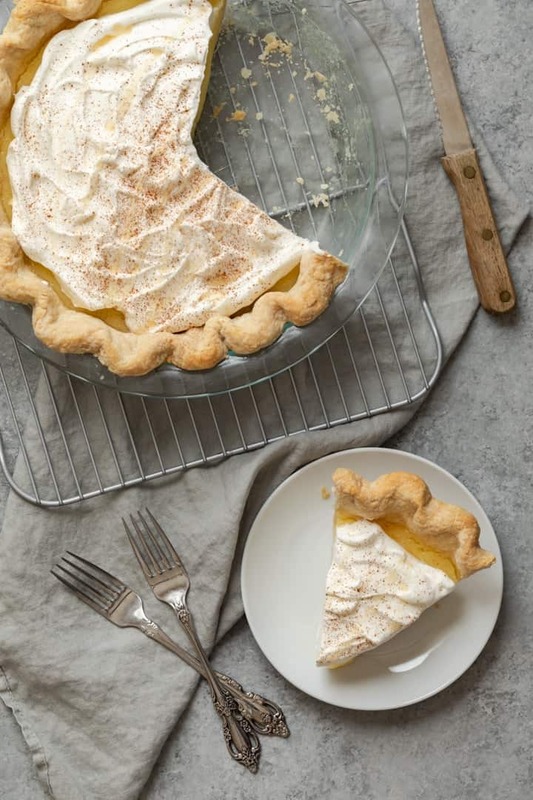 It rests inside a flaky pie crust and the gets topped with whipped cream, honey, and cinnamon. Vinegar Pie may sound weird but it’s actually very unique and super tasty. It’s a classic pie originating in the North and Midwest back in the 19th century. It closely resembles a lemon pie in look and flavor! And it’s made with a homemade pie crust. If you’re looking for something different to share with your friends and family, this pie is it! Have you ever had a desperation pie like vinegar pie? A very dear friend of mine sent me images from an old church cookbook that belonged to her grandmother. 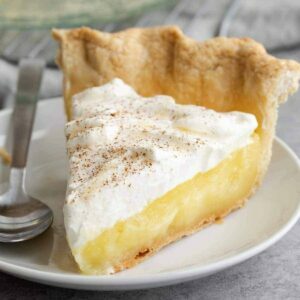 There were so many interesting recipes in that book like lemon chess pie and honey pie, but vinegar pie caught my attention. 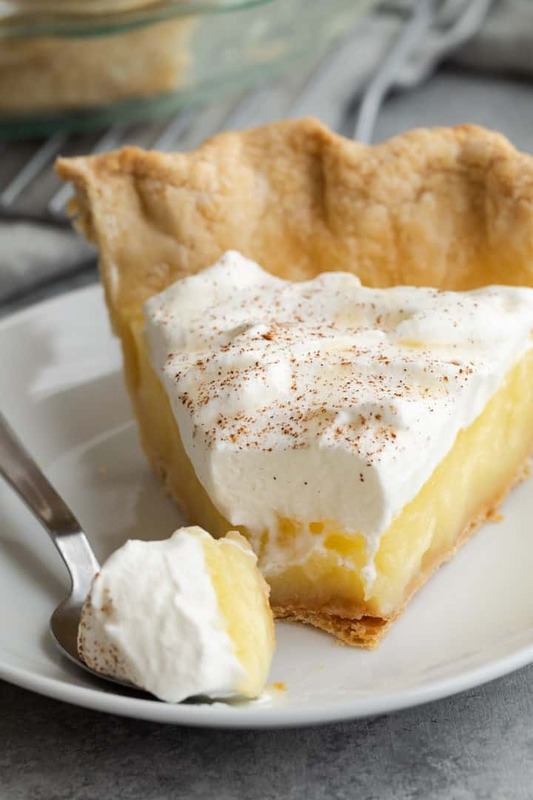 After doing some more research I learned that this pie was super popular in Kansas where my friend and her family are from. Back in the day when resources were low, people would turn to vinegar as a flavoring. This is how vinegar pie came to be. And, surprisingly, it’s very good! 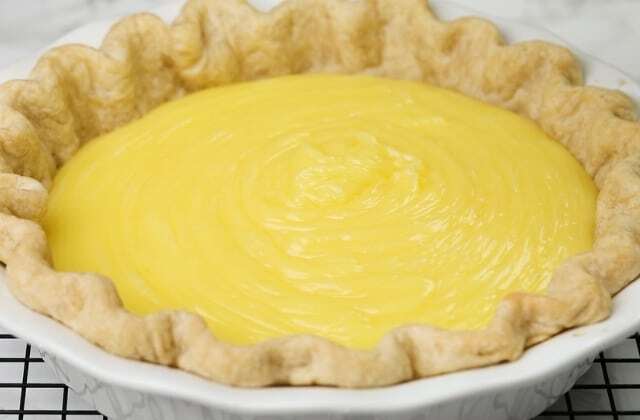 The crust is thick and flaky which is a great contrast to the custard filling and it’s prebaked so it remains crisp after adding the filling. The filling is cooked on the stovetop before it goes in the crust to be baked again. This makes sure the filling is thick and fully set. Adding whipped cream helps balance the tart flavor of the filling. How to make vinegar pie? There are several ingredients needed for my version and most of them you will already have in the pantry. The pie will need to chill in the refrigerator afterward so it sets up. It’s best to let it chill overnight. But you can get away with only a couple hours in the refrigerator after it has cooled completely to room temperature. I topped the pie with homemade whipped cream but I’m fairly certain meringue would be just as delicious. A sprinkle of cinnamon and a drizzle of honey tied the whole thing together. I highly recommend the honey. It pairs wonderfully with the filling. Make the crust. 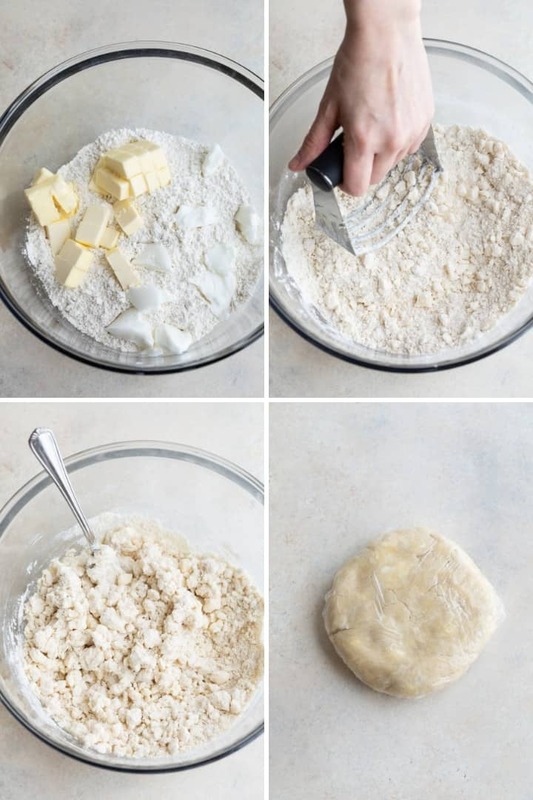 Cut butter and shortening into flour and salt until pea-sized crumbs form. Drizzle in just enough cold water to get the dough to stick together. Wrap the dough in plastic wrap and refrigerate it for 2 hours. Bake the crust. Roll the dough out to fit into a 9-inch pan. Trim off the excess and flute the edges. Prick the bottom of the crust with a fork and line it with parchment paper. Fill the paper with pie weights, dried beans, or rice, and bake for 20 minutes. Remove the parchment paper with the weights and bake for another 8 minutes. Make the filling. Heat water and vinegar to a boil. Whisk eggs, sugar, cornstarch, and salt together. Slowly drizzle the hot liquid into the egg mixture while stirring constantly. Pour the custard back into the post and cook until thickened while whisking constantly. Whisk in butter and pour the hot filling into the baked pie shell . Bake. Bake the pie for 15-18 minutes until the filling has set but jiggles slightly. Cool and refrigerate. Allow the pie to cool to room temperature then refrigerate it for at least 4 hours. Add toppings. Spread whipped cream over the top of the filling. Drizzle with honey and cinnamon if desired. What does vinegar pie taste like? 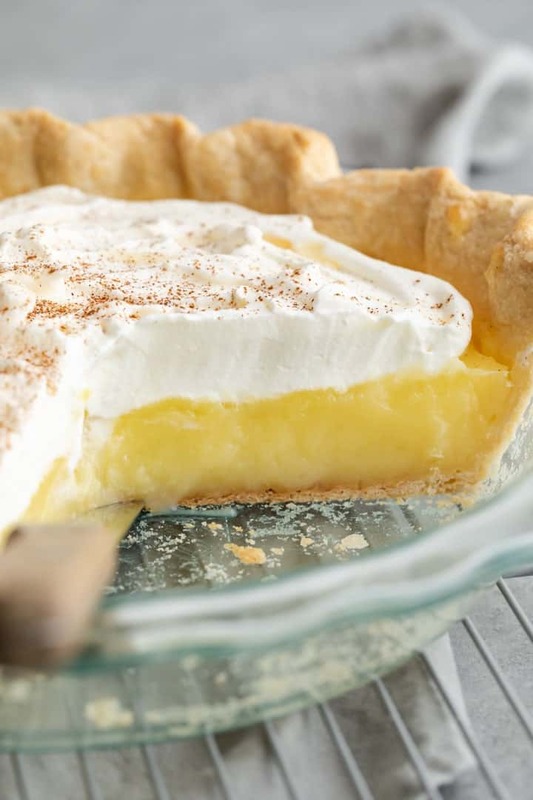 To me, the pie tastes tangy like a lemon pie. Then sugar gives it a luscious sweetness to balance the tart vinegar. It’s really hard to describe the flavor but the vinegar works in this pie. What type of vinegar is best for vinegar pie? The type of vinegar makes all the difference. I tested this recipe with cider vinegar because it’s called for in many recipes online. Cider vinegar does not work in this pie. It’s gross! DON’T DO IT! Choose a distilled white vinegar with around 5-8% acidity. Combine the flour and salt in a large mixing bowl. Using a pastry cutter or two knives cut the butter and shortening into the flour mixture just until coarse crumbs form. Don’t try to work it in too well. Large clumps are perfectly okay. Drizzle just enough ice water over the flour to moisten it. You will know you have enough liquid when you can squeeze the mixture and it holds together. Shape the dough into a ball and flatten it into a disc. Wrap the disc with plastic wrap and refrigerate for at least 2 hours. On a lightly floured surface, roll the pie crust to fit a 9-inch pie dish. Place in pie dish; trim off any excess along the edges. Flute the edges with fingertips. Prick the bottom of the crust with a fork. Line with parchment paper and fill with pie weights. Bake for 20 minutes. Remove the weights and parchment paper. Bake for another 8 minutes. While the crust is baking, make the filling. In a medium bowl, whisk the eggs, sugar, cornstarch, and salt. Combine the water and vinegar in a medium saucepan. Bring to a boil over medium heat. Slowly add the warm water mixture to the egg mixture, stirring constantly. Slowly pour the mixture back into the saucepan. Cook over medium heat, stirring frequently until the mixture begins to bubble and thicken. Reduce the heat to low and continue to cook, stirring constantly until the mixture is thick like pudding. Stir in the butter until melted and fully combined. Pour into the prepared pie crust. Bake for 15-18 minutes, until the pie is set but jiggles slightly. Cover the edges of the crust if they begin to get too brown. Cool on a wire rack to room temperature then refrigerate for at least 4 hours or overnight. Top with whipped cream, cinnamon, and/or honey if desired. The crust can be pre-baked for up to 2-3 days in advance. Cover and store at room temperature. The baked pie will keep for up to 3 months covered tightly and stored in the freezer. Thaw in the refrigerator overnight.